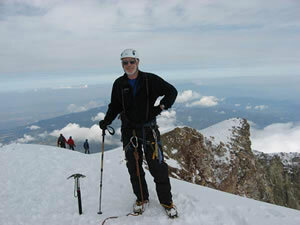 It was in our Spring 1996 Mountain Views that we said hello our new General Secretary ALISTAIR BEELEY. 11 years later, in this issue, we are recording that Alistair stood down from this position at our 2006 AGM. What a valued team player Alistair has been, always ready to listen and support, slow to chide or criticise (a rare quality these days!) whilst enduringly completing all his GS duties without complaint. Another charm of Alistairs is that he always strives, without success, to make out that he is an aged grand-father languishing in restful retiral! Readers of a May 2007 of MCofSs The Scottish Mountaineer can read about his escapades crossing the top of Scotland together our last Chairperson, Roger Owen. Alistair also continues to manage troups of youngsters on walking holidays to all sorts of exciting locations  again belying the image of retiral. The good news is that Alistair plans to stick around because, he tells us, that he finds NEMT handy for keeping up to date with what is going on. On that positive note we can welcome in our new General Secretary HILARY QUICK. Hilarys acquaintance with the hills is through on-going and active participation in Orienteering and Munro-bashing (almost a Munro-ist!) 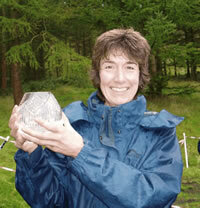 Yes, she has several years experience with voluntary work with various NGOs including Scottish Wildlife Trust, was a previous part time Warden at Bennachie and now works full-time with the Scottish Orienteering Association. Definitely fitting into the ever reliable bracket of if you want something done, ask a busy person Hilary has already made herself seamlessly at home at the General Council meetings and is already proving to be a great asset to NEMT. Her opening gambit is that she Enjoys working with positive people  so yes, I am delighted to record she is a real find and will undoubtedly play an important role in keeping NEMT right on track.